It's always exciting when we receive a box of samples from our factory, as we love to see what couples are ordering. One trend we've noticed recently is vertical envelopes—it's a great way to add a contemporary twist to a classic invitation. Below are a few of our favorites. 1. This pearl folder invitation with a satin band and gold kalogram was designed for Karina and Laith with the help of the team at Paisley & Paper in Greenville, South Carolina. 2. 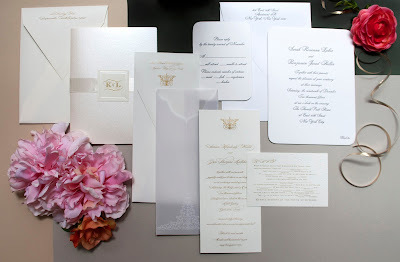 Slim and sophisticated, couple Susan and John's invitation—designed with the help of Events in Houston—was presented to recipients in a lace-patterned vellum sleeve. 3. For this classic Black Tie wedding invitation ordered at Party Plus Studio in South Hackensack, New Jersey, couple Sarah and Benjamin chose details such as rounded corners and a metallic painted edge. Life's richer with friends. Sign up for our monthly newsletter!